A good outdoor rabbit hutch should protect the rabbit from unfriendly weather. A roof is a must and very important to protect the rabbit from the rain and direct sunshine, unless you place it under house roof such as on the porch. Solid walls or at least hutch cover is required to protect from the strong wind and in winter time. It should also give protection against predators such as dogs, snakes, hawks and others. The roof, the walls and the floors should be tight enough to prevent the predators to get through into the hutch. It’s also important there’s a hiding place in part of the hutch for the rabbit to hide from something frightening him, to feel secure. If such area doesn’t exist you may place a nest box or any box inside the hutch. Do you have an Outdoor Hutch for your rabbit? Share with us what does it looks like and submit here! 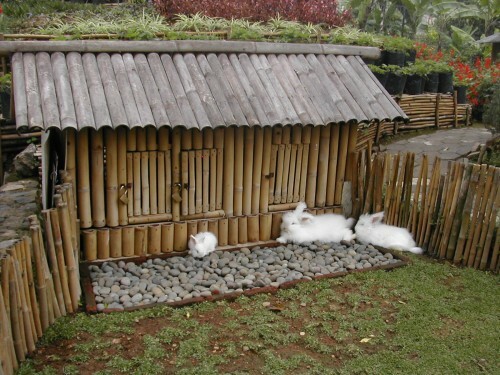 An outdoor hutch in a rabbit garden, it has big playing area with bamboo fence surrounding it. A home-sweet-home for an English Angora rabbit family. The ideal area to place the outdoor hutch is on dry location, quite situation, get morning sunshine and good airflow. Some peoples prefer to put it a bit far from the house to prevent the odor. Rabbits are sensitive to dampness. Dry location will prevent the rabbit to easily get sick, besides it keeps the hutch cleaner. Rabbits are basically prey animals so they also very sensitive to sounds. This instinct keeps them stays alive in nature. “Unsecure” and too noisy sounds may make the rabbits stress. Morning sunshine is very good for rabbit’s health. It also kills germs in the hutch. Good airflow is required to keep the odor away.